James Joyce was born in Dublin 1882, educated at Jesuit schools and university college in Dublin. He came from a well-to-do family that become poor because of his alcoholic father that didn’t work. The catholic church turned against Charles Parnell (one of the leading supporters of Home Rule for Ireland,1846-91) because of his affair with a married woman; the themes of betrayal and the temporary nature of fame influenced Joyce deeply reflecting in his choice of anti-heroes as protagonists and in his rejection of the stiffling atmosphere in Dublin. He didn’t simphatize with the nationalist movement, he saw patriotism as a backward movement which paralised the development of a free spirit in Ireland. He became a religious sceptic but never hostile to the church. He self-imposed exile , left Ireland in 1904 (he gave private lessons in Trieste and worked in Rome in a bank) when he wrote The Dubliners (written between 1905-09, published in 1914). Collection of stories, easy to read, simple language but deep meaning, contrast and continuation of the time , past-present-future, cyclical circle of events that continues and time has his effects on characters (Bergson "la durée"). He had lost his commanding role in art: its task is neither to teach nor to convince but to make people aware of reality through their own subjective feelings. He adopted different point of views, different narrative techniques (from third person narrator to the stream of conciousness-interior monologue, where the lack of punctuation or sintax are meant to reproduce in writing the movement of thought). Joyce used different linguistic styles appropriate to different carachter and situation, linguistic resourcefulness. He was able on render in writing the rithm, tone and pitch of a large variety of speaking voices. 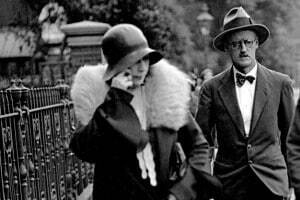 He invented new words but nobody could understand, Joyce’s mission was to create a new language. He considered youth, adulescence, adulthood and maturity, and how identity is affected by these different stages of life. "Eveline": she exempifies well both Joyce's use of form and theme, she faces the first challenge of adulthood dreaming of escaping from her drab life, but at the crucial moment she is powerless to act. Altough the narrator rarely disappear, the story is a form of third-person narrative which proceeds entirely from Eveline's point of view, mostly from inside her mind. The language reproduces the plain vocabulary and simple syntax of the character. "Ulysses": it exemplifies the work's parallelism with the Odyssey: it contrasts the episode of Nausicaa's capacity to see beyond appereance and her coming into womanhood with Gerty's projection of her romantic fantasies onto reality. He shifts from third-person narration to interior monologue. The language at the beginning is rich in onomatopoeic words, "baby" language, and informal language to add to the realism and vividness of the scene. He wrote some notes to better understand the symbolism. The mythical method: myths offered a pattern on which to arrange the fragments of experience and also served as a substitute for plot.